The Murders of John Levy and Annie Gale By William Seaman. Today Turner Street is a nondescript thoroughfare that stretches from Whitechapel Road to Commercial Road, its northern section running alongside the London Hospital. Walking along it you reach its junction with Varden Street where a modern textile warehouse at number 31 occupies the site of the house that, in 1896, was home of Mr. John Goodman Levy. However, if you look to to the opposite corner, number 33 Turner Street has survived and this gives an impression at least of what number 31 would have looked like when, in April 1896 two brutal murders, that caused genuine shock to the district, took place inside the house. 33 Turner Street, August 2016. The two victims were Mr Levy himself, aged 75, and his housekeeper, Mrs Annie Sarah Gale, aged 37. As it transpired, the murderer was still on the premises when the police arrived and, in trying to escape from the scene, he was seriously injured when he jumped from the roof of the house into the street below. Here, he had to be rescued by the police from the clutches of an angry crowd who had gathered in the street when news of the murders had broken. The police took the man to the nearby London Hospital, where he was treated for his injuries and was identified as a notoriously violent 46-year-old local housebreaker by the name of William Seaman. The full story of the murder, and the subsequent events, was carried by The Illustrated Police News in its issue dated the 11th April 1896. “Early on Saturday afternoon the East-end of London was plunged into a state of wild excitement by the harrowing details which came to hand of one of the most brutal double murders accompanied by attempted burglary, which have been recorded for years in the annals of metropolitan crime. The scene of the outrage was 31, Turner Street, Commercial Road East, not far distant from the locality it which the series of Jack the Ripper murders were perpetrated. The victims of the assassin’s knife were Mr. John Goodman Levy, aged about seventy-four, an umbrella case manufacturer, and his housekeeper, Annie Sarah Gale, a married woman, between thirty and forty years, who had acted as a domestic servant in the Levy family for some years. The Victims Mr John Levy and Mrs Gale. 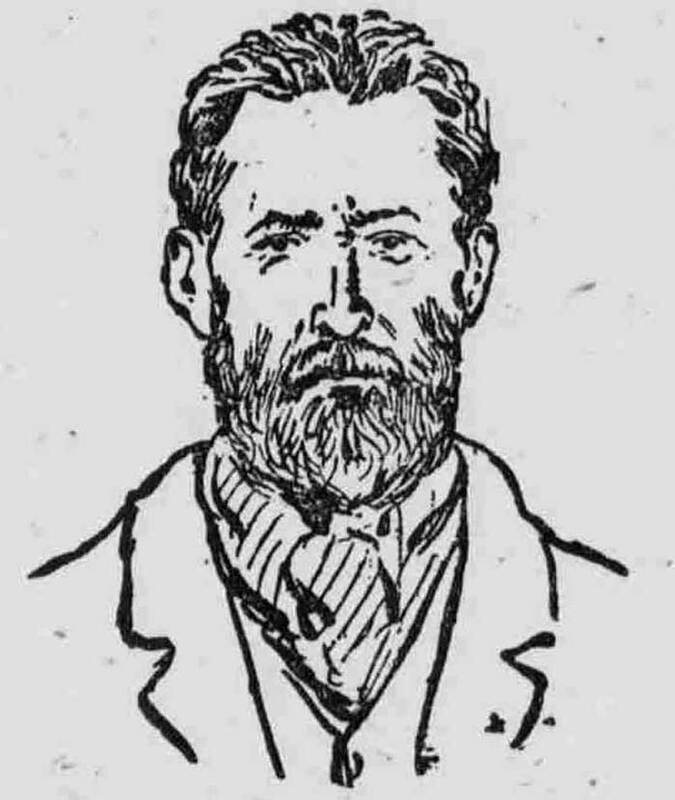 From Lloyd’s Weekly News 12th April 1896. It was only some six weeks since that Mr. Levy, who was well known in the neighbourhood to be a man of prosperous circumstances, retired from the business which he had carried on for many years under the style of M. J. Myers, and handed it over to a stepson, who was the offspring of his wife’s first marriage. He seems to have been, from all accounts, a very popular personage in the surrounding district, alike from his genial disposition and the liberality with which he supported the local charities. Though the deceased man’s stepson continued to conduct the business to which he had succeeded on the old premises, as a matter of fact he lives with his family at Coborn Road, Bow; and 31, Turner Street, was only occupied for residential purposes by the murdered man and woman. It is a three-storied house containing eight rooms, the entrance being situated in Varden Street, one of the numerous thoroughfares intersecting Turner Street. According to the neighbours, it was well known that old Mr. Levy kept a considerable amount of valuable property in the shape of gold and jewellery, on the premises, and within the last few weeks the house is reported to have been visited by burglars, though their efforts were not rewarded with any large amount of spoil. At all events, there can be no doubt that after this attempt was made Mr. Levy placed himself in communication with the police, and that the officers on duty kept a sharp eye on the house at night. The first suspicion of foul play which was aroused was when, shortly before one o’clock on Saturday Morning, Mrs. Lawton, a cousin of the deceased man, who lives in the same street, went round to the house in response to an invitation to dine with her relative. Much to her astonishment she remained knocking at the door for some minutes without any response being forthcoming, and then a strange feeling came over her that something wrong had happened to the inmates within. The loud and constant rapping attracted the attention of the next-door neighbour, a tailor named Mr. William Schafer, who went out to see what was the matter. Mrs. Lawton told him she was unable to make anyone hear at 31, and she then suggested that he should go to his back yard, and see if he could ascertain anything by getting on to the partition wall. This proposal Mr. Schafer at once put into execution, while the woman went off to fetch other assistance. Schafer, on mounting the wall in question by means of a ladder, was astonished to see the head of a strange man in a brown cloth cap just inside the small window which gave a view of the narrow corridor leading to the doorway affording antecedence from Varden Street. He shouted out to the stranger, who immediately disappeared from view, only to reappear, however, a few minutes afterwards, when he thought that all was clear before him. In this the man was very much mistaken, for Schafer was only remaining in concealment behind a wall, and the moment he exposed himself to view the tailor demanded what he was doing there. Fully convinced now that something wrong had happened, and apprehensive of the worst, Schafer rushed through his house and made for the street, with a view to alarming the police. On his arrival there he found other neighbours already collected in front of No. 31. The constables on duty in the vicinity were immediately summoned to the spot, and a couple of them, under the guidance of Schafer, made their way to the back of No, 29, scaled the partition wall, and effected an entrance into Mr. Levy’s house. Meanwhile a strict watch was kept on both the front and back of the premises, to prevent the strange man who had been seen from making his escape. The police, apprehensive that murder had been committed, and that the burglars might still be in the house, invited the aid of one or two passers-by in the street, and the party then proceeded to search the premises. Their worse fears were only too soon realised, for half concealed behind the door of the lavatory on the ground floor at the back they discovered the body of Mr. Levy lying in a pool of blood. The Open Door Where The Body Of Mr Levy Was Discovered. From Lloyd’s Weekly Newspaper. 12th April, 1896. His throat had been cut from ear to ear with some sharp instrument, while the back of the skull had been battered in with what appeared from the terrible nature of the wounds to be a hammer. The head and face of the dead man, as well as his clothing, were covered with blood stains. The features bore an agonised look, though death must have been instantaneous. Continuing their search over the house, the police found drawers ransacked and overturned, while a safe on the first floor in which Mr. Levy kept much valuable property had been shifted from its position and turned round, evidently with a view to its being forced from the back. In the back room on the second floor – used as a bedroom, it is understood, by the housekeeper – another ghastly spectacle was witnessed. Stretched on her back on the floor by the side of the bedstead lay the dead body of Mrs. Gale in a pool of blood, which was streaming in all directions. The Room Where The Body Of Mrs Gale Was Discovered. From The illustrated Police News, 12th April 1896. The poor woman had been frightfully mutilated. Her head was almost completely separated from her body, while, as in the case of her fellow victim, the skull had been most unmercifully beaten in with a blunt instrument of some kind. It was evident that, although taken by surprise, the housekeeper had fought fiercely for her life, for everything was in a state of wild disorder, while splashes of blood are also stated to have been found on the walls. To judge by appearances, Mrs. Gale must have been in the act of making the bed when assailed by her murderer. Passing to the front room on the same floor, the horrified officers at once detected a hole in the ceiling giving access to the roof. The laths and plaster had been beaten in with a hammer, and an aperture made sufficiently large to admit of the easy passage of a man’s body. While this search had been in progress a strong contingent of police had been summoned to the scene of the tragedy, and Turner Street had rapidly filled with an excited crowd. A ladder was at once fetched, and so placed as to enable the police to gain the roof. They, however, were too late to arrest the murderer and would-be burglar. One constable had just got his body half-way through the hole when he caught sight of a man standing in the gutter which ran round the roof. In another moment the murderer had mounted the coping, hauled himself over by his hands, and dropped into the street below, a distance of between 40ft and 50ft. There is almost universal testimony on the part of those who witnessed this sensational incident that the man did not take, as has been alleged, a frantic leap over the parapet, but that he simply dropped himself over the wall. Proof of this is to be found in the fact that a little girl, named Leah Hyams, who was struck on the back by the falling body, was at the time standing with her mother close under the wall at the Varden Street entrance to the house. The murderer, when he made his desperate descent, had with him two bundles in which apparently he had collected his plunder. These parcels on being subsequently examined by the police were found to contain several gold watches, a number of rings, and other jewellery, as well as a quantity of money. Other property was also discovered ridden on the person of the burglar, which has Since been identified as belonging to the de-;eased persons. As the man struck the pavement, with a dull thud, he was at once seized by the police. Obviously he had sustained serious njuries, for he was in an insensible condition. An ambulance was fetched, and between two and three o’clock the man was conveyed by constables to the London Hospital. Here he received the prompt attention of Mr. Lewis Smith, the senior house surgeon, who ascertained that he was suffering from concussion of the brain, a fractured right shoulder and injuries to the right leg. The man remained in an insensible condition throughout the night, and it was not until Sunday afternoon that consciousness returned. In the course of an interview on Sunday Mr Lewis Smith said the patient was in a very dangerous condition, though he entertained hopes of his recovery. He had permitted no one, not even the police, to see the man, as quietude was absolutely essential. The prisoner who spoke English well, had said nothing as yet about the murders, and up to then not even his name had been ascertained. The officials at the hospital who superintended the removal of the man to the ward in which he is now lying describe him as being a person of medium height and rather sparely built, with iron-grey moustache and beard. He seemed to be of foreign extraction, and between thirty and forty years of age. The little girl Hyams was also picked up in an insensible condition and taken to a neighbour’s house, where restoratives were applied. On being brought to she was removed to the hospital, where she received the attention of the house surgeon. Her back was found to be injured, while the child was also suffering from fright. Subsequently she was considered to have sufficiently recovered to be sent home. On inquiry being made on Sunday afternoon at her parents home in Turner Street, it was stated that Miss Hyams complained greatly of pains about the body, and was still suffering from fright. Immediately upon the discovery of the bodies being made Drs. Michael and Ambrose, two neighbouring medical practitioner’s, were sent for. So terrible was the nature of the wounds that had been inflicted that it was pronounced that death in each case must have been almost instantaneous. Conjecture is still rife as to the time when the foul deed was committed. The probabilities are that the murders took place some time after the breakfast hour, for evidence was discovered on the premises to establish the fact that the ill-fated couple had that morning partaken of breakfast as usual. The police at present are at a loss to determine by what precise means the burglar effected an entrance into the house, for neither at the front nor rear of the premises have any traces of the cracksman’s handiwork as yet been found. The authorities at the Arbour Street Station, who have taken charge of the ease, are said to entertain the belief that only the man now lying at the London Hospital is implicated in the affair. They are, however, very reticent on the whole matter, and on Sunday declined to give information of any kind. It is now known that the weapons with which the murders were perpetrated consisted of a formidable-looking clasp knife and a heavy hammer. Both instruments were in the course of Saturday afternoon found on the roof. They were clotted with blood, and had apparently been dropped by the burglar in his hurried flight when discovered by the police. The bodies of the victims now lie at the mortuary awaiting the inquest. Throughout Saturday and Sunday great excitement existed throughout the East End, and the scene of the tragedy was visited by many thousands of people. A later account says the man in custody at the London Hospital was on Sunday identified by Detective-inspector Marshall, of Scotland Yard, as one of a daring gang of burglars who have infested the metropolis for many years past. The officers in charge of the case refuse to divulge the name of the man, but he is known to the members of the Criminal Investigation Department under several aliases. The prisoner is a thick-set man, between 5ft 8inches and 5ft 9inches in height, with slightly bent shoulders and a small tuft of red whiskers under the chin. He has been engaged, it is said, in many notorious robberies, and has spent a consriderable number of years in prison. On one occasion he was sentenced at the Old Bailey to penal servitude for robbery with violence, and he has undergone long terms of imprisonment for housebreaking in various parts of the country. That the dastardly murder in Turner Street was the work of the gang of thieves with which the prisoner had been so long identified has left little room for doubt amongst those officers engaged in the case. The fact that the murder was not the work of one man has also been clearly established after a minute examination of the house and the rooms where the murders were committed. The footprints in the attics and on the staircase clearly show that the man in custody was assisted in carrying out his nefarious work. There was little doubt that William Seaman had murdered Mr. John Goodman Levy and Mrs Annie Sarah Gale on the 4th April 1896. He made for a pathetic sight when, on Friday 1st May, 1896, he appeared at Thames Police Court. The Injured William Seaman Appears At Thames Police Court. From Lloyd’s Weekly Newspaper. He was executed at Newgate Prison on Tuesday 9th June 1896.